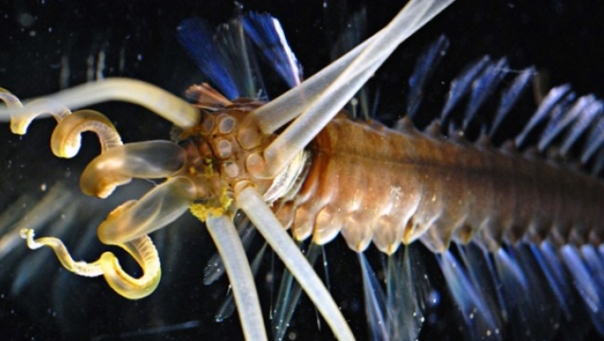 The bizarre, newly-revealed squidworm — a free-swimming worm with up to 10 squid-like limbs — is one of a host of strange discoveries that await scientists in the vast, largely unexplored spaces of the deep ocean. New anatomical and genetic analysis of the squidworm (Teuthidodrilus samae) has revealed it to be a segmented worm — an annelid, just as the earthworm is. But its appearance is far stranger than any backyard night crawler you’ve ever seen. The slimy animal’s flattened body is about 3.5 inches long. It possesses 25 or more pairs of translucent white paddles arranged on its sides for swimming and up to 10 fragile, tentacle-like appendages at its head that are the same length as its body or longer.